LILONGWE-(MaraviPost)-The former President Joyce Banda (JB) who is also Peoples Party (PP) leader on Monday told the nation that her party’s support for Malawi Congress Party (MCP)’s Lazarus Chakwera presidential candidature is for Malawians not personal interests. JB added that her choice for MCP delivered from 2015-2016 talks she has been with both Chakwera and his running mate Mia on possible ways to serve Malawians. The former Malawi leader disclosed that her party’s alliance with Vice President Saulos Chilima’s UTM Party was not legal bonded as no concrete agreement was reached. She added that MCP has similar ideology and Manifesto hence the need to work together to bail out Malawians from social-economic ills. Banda assured the nation that her time to look for positions in government was over but only giving proper guidance on the right path Malawians must take during this year’s May 21 polls. She therefore disclosed that both MCP , PP shadow lawmakers and ward councilors will compete individually in all constituencies that the best candidate should win. 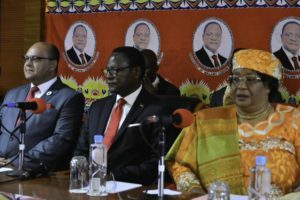 The former Malawi leader jointly held a press conference with MCP leadership Chakwera, Mia, Mkandawire to reaffirm the electoral alliance to the nation ahead of May 21 polls. “I have not betrayed anyone in PP by supporting MCP Chakwera candidature. 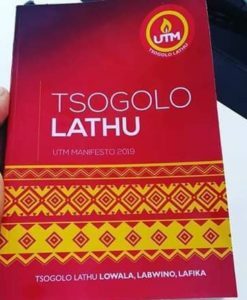 This is a decision by the party’s National Executive., the same body that wanted to support Chilima. “PP is ready to go flat-out campaigning for Chakwera while maintaining each parties structures as the party’s interest is for Malawians not Joyce Banda” says JB. Chakwera therefore assured the nation that the electoral alliance was in a good faith to bail Malawians from social economic ills. JB continues to think Malawians are stupid! of course this move is for your own political survival! you can see that you have no chance whatsoever and so you need ed a slightly more dignified exit! its better to admit zikakukulila! well done! Go back to Diaspora!